Tuesdays are the perfect day to blow off some steam. Maybe it's because it's no longer Monday, or maybe it's just the fact that Tuesdays blend well with wins - whatever the reason, every Tuesday when you deposit as little as $35 you're entitled to play with a 77% Bonus plus 77 Free Spins! Help Uptown's Cash Bandits escape from the police and you'll be rewarded with more coins you can hold! Get to the vault and that's where you'll find wins mixed in with the wilds, scatters and bonus round features! 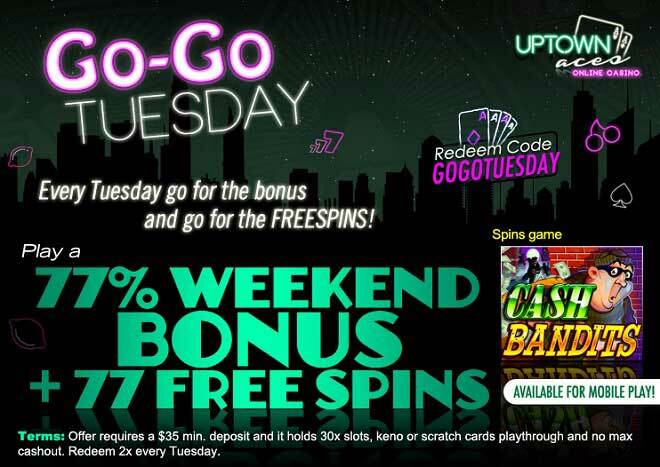 Make this a Go-Go Tuesday and mix it with a 77% Bonus and 77 Free Cash Bandits Spins! Play a 77% Weekend Bonus + 77 Spins!